Me and my cousins will have our vacation in Hongkong starting on May 24 at 9pm up to May 29, 2011 at 8am. We have set our 1st day to a trip to Macau then HK Disneyland on the second day. I would want to request if you can set our itinerary on our 3rd and 4th day because we want to visit Ocean Park, Victoria Peak, the Giant Buddha and the night markets. Can you also state the MTR stations on how to get there? and by the way we will be staying in Lantau. Thanks! Feb19: Ngong Ping 360 then the Victoria Peak at night. Feb20: Spend the whole day at Disneyland. Don't miss the "Disney in the Stars" Fireworks at 8pm. Feb21: Visit the Ocean Park until late afternoon then the Avenue of Stars and Symphony of Lights at 8pm. Feb22: Shop at the famous Street Markets or visit some of the Hong Kong Museums. I hope the above information will help you on this exciting trip. hello! I'll be coming over to hongkong on feb 19 to 22, 2012, arriving in the morning and departing at night. what would be the best itinerary i could have? Re: How to make our HK stay memorable and adventurous? Hope everything was Ok and hope that you can give us some feedbacks. Here's my itinerary suggestion in your 3rd and 4th day stay in Hong Kong. 3rd day: Ocean Park from 10:00am until 4:30pm --> Victoria Peak until 7:00pm --> Victoria Harbour to visit HK's new attraction, the Avenue of Stars and also, to watch the nightly show "Symphony of Lights" that starts at 8:00pm. This itinerary is guaranteed to be your most memorable day in HK. 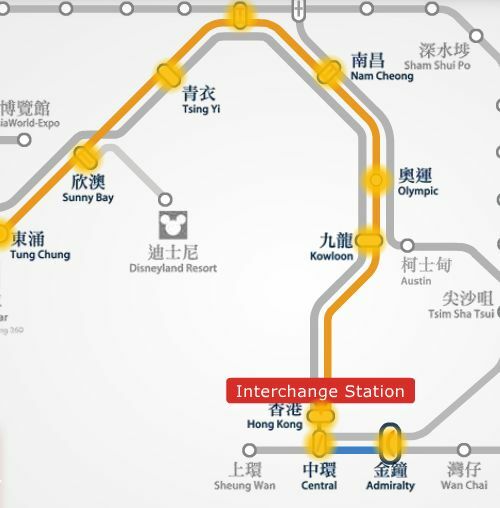 Considering that your hotel in Lantau is close to Tung Chung then the fastest and cheapest way to get into Ocean Park is by taking the MTR trains plus a short bus trip. Get into the Tung Chung MTR station and take the Tung Chung Line trains that will bring you all the way to Hong Kong station. Walk to the nearby Central station and take the Island line trains to Admiralty station then take Exit B (38 minutes @ HK$18.4). Here's the MTR route map between Tung Chung and Admiralty station. Upon exit at Admiralty, get on the special CityBus No. 629 that will bring you straight to Ocean Park, 15 minutes bus ride @ HK$10.6. Get back to Admiralty by taking same bus then take a short taxi ride to the Peak Tram terminal, 10 minutes @ HK$20. Get into the Peak Tram that will bring you up to the Peak. Take the Peak Tram back to the Tram Terminal and nearby you'll find the Peak Tram Bus Terminal. Take the Bus 15C to Central Ferry Pier Bus Terminus, about 10 minutes @ HK$4.2. Walk about 4 minutes to nearby Star Ferry Pier no.7 and take the Star Ferry to Tsim Sha Tsui, 8 minutes @ HK$2.5. To view route map, please click here. Walk to along the TST promenade to visit the Avenue of Stars and stay on that area and wait to watch the Symphony of Lights before going back to your hotel at Lantau. 4th day: Ngong Ping 360, HK Shopping, and theme Street Market shopping. Please follow the links to see more information specially in getting there.